Charlie Bucket has been found and he has a Golden Ticket! Producers John Frost, Craig Donnell, Warner Bros Theatre Ventures, Langley Park Productions and Neal Street Productions have announced the four boys who will play the role of Charlie in the spectacular new musical Roald Dahl's Charlie and the Chocolate Factory. Roald Dahl's delicious tale will be playing only in Sydney at Sydney's Capitol Theatre from 5 January 2019. 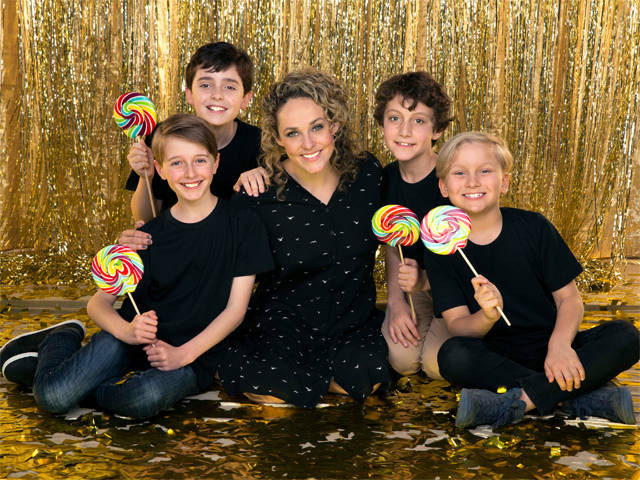 Oliver Alkhair (11 years of age, from Panania), Tommy Blair (11, Engadine), Xion Jarvis (9, Burwood Heights) and Ryan Yeates (13, Canada Bay) will share the role of Charlie Bucket in Charlie and the Chocolate Factory. Charlie lives with his mother and his four grandparents in a little wooden house near a great town, and is the final child to find a Golden Ticket. Willy Wonka, the most amazing, fantastic, extraordinary chocolate maker the world has ever seen, will be played by Paul Slade Smith. Slade Smith is currently appearing in the Broadway revival of My Fair Lady at Lincoln Center, and was part of the original Broadway cast of Charlie and the Chocolate Factory, appearing as Grandpa George. Previously he performed in Finding Neverland on Broadway, and took over the roles of Charles Frohman and Captain Hook from Kelsey Grammer. He has also appeared in Wicked as Doctor Dillamond and The Phantom of the Opera. Ninety and a half year old Grandpa Joe, an enthusiastic storyteller and eternal optimist, will be played by Australian show business royalty Tony Sheldon. Sheldon is best known for playing the role of Bernadette in Priscilla, Queen of the Desert for over 1,900 performances in Australia, New Zealand, London, Toronto and on Broadway, winning the Theatre World Award and nominations for the Tony Award as Best Actor in a Musical, the Drama Desk Award, the Drama League Award and the Outer Critics Circle Award. His extensive career includes roles for the Sydney Theatre Company, Melbourne Theatre Company and Nimrod, as well as starring roles in the musicals The Producers, Man of La Mancha, Dirty Rotten Scoundrels, Hello, Dolly! and Camelot. In the role of Mrs Bucket, a kind, caring mother and a woman of few words, will be Lucy Maunder. Most recently Lucy played songwriter Cynthia Weil in Beautiful: The Carole King Musical, and prior to that toured New Zealand, Adelaide and Perth in Matilda: The Musical, in which she played Miss Honey and was nominated for a Helpmann Award. For the Gordon Frost Organisation, Lucy played Lara in Dr Zhivago and Rizzo in Grease. They join the previously announced cast members, including Jake Fehily and Octavia Barron Martin as Augustus Gloop and Mrs Gloop, Karina Russell and Stephen Anderson as Veruca Salt and Mr Salt, Jayme-Lee Hanekom and Madison McKoy as Violet Beauregard and Mr Beauregard, and Harrison Riley and Jayde Westaby as Mike Teavee and his mother Mrs Teavee. Completing the wonderfully talented cast are Johanna Allen, Sheridan Anderson, Hayden Baum, Kanen Breen, Bayley Edmends, Bronte Florian, Todd Goddard, Madison Green, David Hammond, Sasha Lian-Diniz, Aaron Lynch, Jordan Malone, Kassie Martin, Phoenix Mendoza, Adam Noviello, Glen Oliver, Danielle O'Malley, Jackson Reedman, Emma Russell, Taylor Scanlan and Thalia Smith. The producers are thrilled with their talented cast. "We have found such a gloriously talented bunch of performers to create Charlie and the Chocolate Factory for Australia," they said. "The world fell in love with Roald Dahl's bewitching tale when the book was released, then filmgoers adored the 1971 film with Gene Wilder. Now this fabulous cast will enchant audiences with the story once again on stage." "This is such a wonderful story for generations to share," added John Frost. "Parents love sharing their favourite Willy Wonka film from their childhood with the whole family, and grandparents love taking their grandkids. We have an amazing cast to bring this story to life." The Australian premiere has been secured for Sydney by the NSW Government's tourism and major events agency, Destination NSW, and will be a major drawcard for visitors to the State. NSW Minister for Tourism and Major Events Adam Marshall said, "Charlie and the Chocolate Factory is a highlight on our major events calendar for 2019, with more than 76,000 overnight visitors anticipated to travel to Sydney to see the production, generating an estimated $37 million in visitor spend. "Securing the Australian premiere of Charlie and the Chocolate Factory further cements Sydney as the home of musical theatre and we can't wait to see Charlie, the amazing Willy Wonka, Grandpa Joe and Mrs Bucket take the stage. I encourage everyone to buy their golden ticket, and to start planning their trip to Sydney." Step inside a world of pure imagination. Roald Dahl's Charlie and the Chocolate Factory is the perfect recipe for a delectable treat: songs from the original film including "Pure Imagination", "The Candy Man" and "I've Got a Golden Ticket", alongside a toe-tapping and ear-tickling new score from the songwriters of Hairspray. Charlie and the Chocolate Factory is perhaps Roald Dahl's best-known story and has proved to be one of the most enduring children's books of all time. The story of Charlie Bucket, the five Golden Tickets, the Oompa-Loompas and the amazing Willy Wonka has become firmly embedded in our culture since it was first published in 1964. Conservative estimates suggest the original book has sold over 20 million copies worldwide; it is now available in 61 languages. Roald Dahl began working on Charlie and the Chocolate Factory in 1961, but its origins can be traced all the way back to Dahl's own childhood. In his autobiography, Boy, he tells us how, while at school in England, he and his fellow Repton students were engaged as 'taste testers' for a chocolate company - something that seems to have started him thinking about chocolate factories and inventing rooms long before Mr Wonka was on the scene. But when he came to write Charlie and the Chocolate Factory, the story went through several drafts until the story as we now know it was released in 1964. Roald Dahl's Charlie and the Chocolate Factory features direction by three-time Tony Award winner Jack O'Brien, music by Grammy, Emmy and Tony Award winner Marc Shaiman, lyrics by Grammy and Tony Award winners Scott Wittman and Marc Shaiman, a book by Artistic Director of Edinburgh's Royal Lyceum theatre David Greig, choreography by Tony Award nominee and Emmy Award winner Joshua Bergasse, and includes additional songs by Leslie Bricusse and Anthony Newley from the 1971 Warner Bros motion picture. Scenic and costume design is by five-time Tony Award nominee Mark Thompson, lighting design by four-time Tony Award nominee Japhy Weideman, sound design by Andrew Keister, projection design by Jeff Sugg, puppet and illusion design by Obie and Drama Desk Award winner Basil Twist, and music supervision by Nicholas Skilbeck. Now it's Australia's chance to experience the wonders of Wonka like never before - get ready for the Oompa-Loompas, incredible inventions, the great glass elevator and more, more, more at this everlasting showstopper!